So You Think You Can’t Lose Weight? 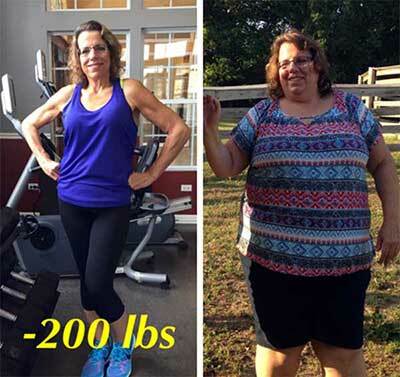 Well, Lisa Stutz lost 206 pounds in 17-months—without drugs or surgery—at age 54! This story is so inspiring I wanted to share it with everyone. How did Lisa accomplish this? She said it really encompassed her whole being—mind, body and spirit. She lost a lot of weight, but she also lost the emotional baggage. She began by getting in a good place—by starting to love herself and replacing negative thoughts with good positive ones. She joined a church to learn more about religion and her fellow congregants showed her love and acceptance—she started to feel good about herself. Now, she surrounds herself with positive, like-minded people. In the past, like most people, she tried many diet plans and her weight went up and down. Ultimately, she ended up gaining weight. When she became emotionally ready to lose weight, she hired a fitness coach who helped plan meals and develop a fitness plan. At first she could only walk a short distance, but every day, she walked a little further. Then she started pool exercises and gradually working her way up to a treadmill. She further progressed to an elliptical machine, then weight training and a StairMaster®. During her loss phase, she trained for a tower climb—her schedule was intense—she worked out twice a day. Lisa got up at 3:45 AM and began with cardio exercise for 30-minutes. After work she exercises with the StairMaster® and weight training—six days a week. She follows her blood-type diet by eating small amounts of lean protein (i.e., tuna, chicken, turkey, fish and eggs) with plenty of veggies. She eats six small meals a day consisting of only 3 oz. of protein, veggies and complex carbs. She doesn’t eat processed or fast foods —only real food. She plans her weekly meals on her day off from exercise. This takes time, but she feels it’s worth it. Lisa states that consistency is the key and a cheat meal is allowed one to two times per month. She even went on vacation and still lost weight by maintaining her new lifestyle. Currently Lisa is working on developing muscle definition and training for the Sears Tower climb. Soon, she’ll be transitioning into a maintenance program. She is more self-confident, happy and emotionally stable. She doesn’t have that pear shape often seen in patients who have weight loss surgery. Due to the development of muscle tone, she has very little sagging skin. Thank you Lisa for sharing your story—you have inspired me!